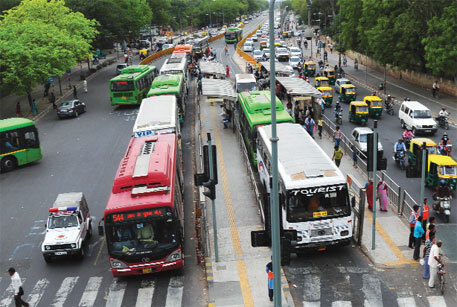 Delhi-based non-profit Centre for Science and Environment has expressed deep shock at the willful decision of the Delhi government to give in to the car lobby and dismantle the bus corridor to take road space back from buses for the cars. The decision has been taken even before the government could find ways to implement an integrated public transport system with BRT and put in place restraint measures for cars and SUVs. “This is a regressive step and gives a wrong signal when the city is gasping for breath and the lungs of every third child are impaired,” said Anumita Roy Chowdhury, CSE’s executive director. Roy Chowdhury added the Delhi government has also made no effort to implement the local solutions crafted by government agency Unified Traffic and Transportation Infrastructure (Planning and engineering) Centre (UTTIPEC) and private company Delhi Integrated Multi-modal Transit System Ltd (DIMTS), to ease the stretch before a full network can be put in place. The CSE executive director is also concerned that in this pollution and climate-challenged world, the Delhi government had earned the dubious distinction of working against the solution for cleaner air and mobility strategies for the larger public good. “This regressive decision has been pushed through even after the latest Economic Survey of Delhi has exposed a drop in bus transport ridership in Delhi. With each bus trip lost to personal vehicles, pollution and health costs will worsen. RITES forecasts that even after the full completion of the Metro rail project, Metro ridership will still be at 20 per cent of all trips in 2021. The bulk of the public transport services will have to be bus-based and BRT will help meet the bulk of public transport ridership,” she added. Delhi today faces the challenge of moving 25 million travel trips a day. “How the people of the crowded city will choose to travel will determine the livability of Delhi and the state of our lungs,” she said. CSE also said that scrapping of BRT corridor went against the basic principles of the National Urban Transport Policy that advises planning of roads for people, not vehicles. Delhi has already built roads obsessively and put 21 per cent of its total area under roads—the highest in the country. The city is still gridlocked and needs a good public transport system with BRT, along with walking and cycling infrastructure. Public policy will have to prioritise clean modes – walk, cycle and bus, to take them out of congestion. She said immediately after introduction of this bus corridor in 2009 the average speed of buses increased from 11-12 km/hr to about 19 km/hr; and more than 50 per cent of the people traveling on the corridor used these buses. The corridor reduced average travel time for bus users by 35 per cent within the pilot corridor. “But the city lost guts to carry this beyond the pilot phase as the car users pushed back. The 14 new BRT corridors planned as part of the integrated transport plan have not been taken forward,” said Roy Chowdhury. RITES has already projected a frightening congestion grid of Delhi by 2021. With more cars on roads, people-carrying capacity of existing roads is steadily declining. The 10 per cent traffic volume on many roads in Delhi consists of buses that transport about 60 per cent of the total people. But the city is not willing to give an inch to the buses. Dedicated bus lane meant for the aam admi is being taken away with no further plans to create bus corridor network when on all neighbourhood roads and sub arterials one lane from the carriage way along with footpaths are being muscled away for dedicated use of car parking for free. Multi-crore investments in BRT corridor will be dismantled at even higher cost, but the government has no policy to recover the true cost of parking in public spaces and the cost of other environmental damages by cars, said Roy Chowdhury. I feared that as I had been told about this in the AFS 15 course by CSE and its official now. Saddening. The lobbying has crippled the government to look beyond the comfort of car manufacturers but about the general public. A very good write up. However, It seems saving BRT might be very difficult at this stage. It would be worthwhile if CSE can immediately initiate a study to track traffic congestion and pollution on the BRT corridor and compare it with the levels just after dismantling of the corridor. This might help our decision makers to gain some perspective.